The easiest way to transport plywood is to load it onto a pickup truck or trailer. But what if you have no truck, no friends with trucks, and no desire to shell out the cash to rent a truck or have the lumber yard deliver the plywood for you? Here, we’ll discuss tips for transporting plywood with a small car, on a roof rack, plus some pointers for strapping it down tightly to prevent loss. Does your car have seats that fold down, and a trunk that allows access into the main passenger area? If so, you are in luck. You can easily transport 4×8 sheets of plywood by loading them in lengthwise. If the back hatch won’t close completely, strap it most of the way down by using the metal latch to hold a length of twine. Secure the twine to an anchoring point inside the car. If you have enough twine, you can pass it under the plywood sheets, back over the top of the plywood sheets, and back through the latch. Next, secure the plywood sheets horizontally. Find a few attachment points inside your vehicle and use them. The upper supports for seatbelts can be good, just be sure you don’t attach lumber to a seatbelt that someone is using. Have your passenger watch for any signs of strain on the twine. Drive carefully and stop to adjust as needed. If your vehicle has a roof rack, you’re in luck. 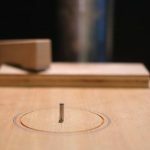 Even if the rack isn’t large enough to accommodate sheets of 4×8 plywood, you can easily rig it so that it provides enough support to keep the plywood from bending. Before using your roof rack to transport plywood, check to ensure that it can handle the weight, keeping in mind that a sheet of ¾ inch plywood weighs close to 100 pounds. If not, don’t attempt it. Driving with an unsafe load can lead to a serious accident, or at a minimum end up with you being slapped with a misdemeanor and being forced to pay a hefty fine. Even if your roof rack has the capacity to carry heavy weight, do not overload it. You might need to make more than one trip if you have a lot of wood to transport. If your car’s roof rack is deemed suitable, move forward with the following steps. 1. Place two 8-foot long 2×4 pieces of wood on the roof rack length wise. There should be a 3 to 3 ½-foot span between the 2x4s. 2. Secure the 2×4 wood to the roof rack by tying it on at several points. 3. Bring two additional 2×4 pieces along. You’re going to be using them to stabilize the top of your load. 4. Buy your plywood and carefully load it up onto the first set of 2x4s. Have a friend help you if possible. This will save your back and protect your car’s paint job. 5. Position the additional 2x4s on top of the plywood. Tie them into place with rope or twine so they won’t move around during your drive home. 6. Use sturdy webbed ratcheting straps to secure all the wood to the roof rack. Place two straps around the narrow sides of the wood and through the car’s interior via the windows or doors. Position the buckles on top so they won’t ding your paint. 7. Position two more ratchet straps lengthwise, under the rack and preferably through the rear trunk opening as well. Do not skip this step. The point is to make your load be one with your car. Even in an accident at slow speeds, it could be detached and become a deadly projectile. 8. Drive carefully, preferably taking side streets with speed limits under 55 miles per hour. Do not push your luck. If your car’s roof rack isn’t rated to carry plywood and you can’t fit the load inside your vehicle, consider the following options. They’re inexpensive, and at the end of the day, they’ll save you undue stress. 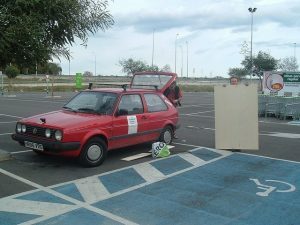 Two man to transport plywood wth VW Golf, Nick T.
• Do you need the plywood to be intact when you get it home? Many lumberyards will happily cut it down into smaller, more manageable pieces that you can load right into your car. • Rent a small truck or moving van. “Local moves” are usually cheap – around $20/day. • Rent a 4×8 trailer and tow it behind your car. Moving companies can easily set your car up for towing small loads. • See if the lumberyard will do a local delivery for a fee. Usually, this costs about $10. If you’re buying a lot of materials, you may even get free delivery. • See about hiring a handyman to carry the load for you in his truck, or offer to pay a neighbor to carry it for you. • If you don’t have the appropriate tiedowns, you will need to buy them. • If you are in an accident caused by an unsafe load, your insurance company might not cover the costs. Your rates will certainly go up in the future. • If your load causes an accident, you will be at fault, even if you thought you tied the plywood down properly. • A gust of wind can easily rip plywood off a roof rack. There are documented examples of this occurring, and in at least one case, the plywood killed a passenger riding in a vehicle behind the one with the unsafe load. • You’re going to spend a lot of time, energy, and worry tying the plywood to the top of the car. You are also going to have to spend time, energy, and worry driving with the load on top of your car. • Finally, though you’ll be relieved that you made it home in one piece, you will spend time untying the plywood and getting it off your car without causing damage. • Even if you tie everything down securely, there’s a chance your car could be damaged.